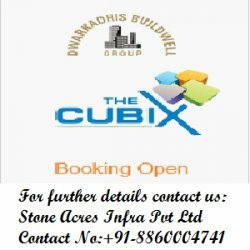 Dwarkadhis Buildwell is launching it's 2BHK, 3BHK & 4BHK state of art floors by the name of "The CUBIX" in Sec-23, Dharuhera. After the successful launch of Antriksh Heights in Sec 84, Gurgaon. Dharuhera is emerging as the new destination for Residential and Commercial activities. Dharuhera by now is known as one of the best industrial area in Haryana. The CUBIX is strategically Located near NH-8, surrounded by all amenities. It's location is ideal in many ways viz. located on NH 8 (Delhi-Jaipur Highway) and is in close proximity to Manesar, Gurgaon and DELHI. Investment region of the Delhi-Mumbai Industrial corridor. Located right on the NH8. An already developed area with major manufacturing Houses companies like Hero Honda , Delphi TVS etc. Big Industrial set up in Bhiwadi/Kushkhera/Tapukara/Bawal & Dharuhera. Already residential area developed by Bestech/Avalon & M2K. EDC/IDC, Car Parking, Club, IFMS, Power Backup charges are included.